What has become of Dušan Třiska (57), one of the fathers of the process whereby the state offered its citizens shares in state property worth a total of CZK 300 billion for a mere thousand crowns each? He caught the train of inchoate capitalism with a ticket from this country’s largest insurer. AT THE BEGINNING of the ’90s, not a day went by without Dušan Třiska, one of the “privatization trojka of Klaus-Ježek-Třiska”, appearing on television. As deputy to finance minister Václav Klaus, he designed the technical solution for the enormous event that ended with investment fund scandals and embezzlement. Years later, Třiska considers the delivery of “his baby” as positive. “The privatization resulted in a new distribution of property and power. In this country it went smoothly, and the result exceeded our expectations,” he says proudly, in spite of the fact that most people now associate the privatization primarily with Viktor Kožený, who was investigated for misappropriation of funds. “Of course we weren’t naive; we figured that some would be able to misuse the privatization. But even though Kožený did many things we didn’t like, in principle he didn’t rob anyone in this country,” explains Třiska. He also rejects the argument that the process was hastily implemented and lacked sufficient legislative controls. “It wasn’t possible to build a legal framework from scratch and then to start building capitalism,” he contends. 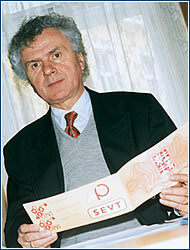 In 1993 Třiska left government service and went into business. He assembled the team that created the conceptual and implementation framework for RM-Systém and the Securities Exchange Center. Four years later, with the same team of experts, he established CD-F, a firm that started providing electronic support to insurance contract managers at Česká pojišťovna (ČP). This cooperation led to financial connections – ČP currently owns a 51% stake in CD-F.
Třiska doesn’t miss the negative media attention connected with the privatization. As for the well-known trojka, he says: “I’m not in contact with Tomáš Ježek – I don’t even know what he’s doing now.” On the other hand, he used to see Klaus every other week, since they both belonged to the Center for Economics and Politics.